Hi everyone! For a long while now I've been meaning to get a PVC cotton apron and it's one of those items that never quite gets into the shopping basket to buy. I decided on the Paisley Park apron which is in a light blue and pink paisley floral design with a pink binding all the way round. Although it is one size the waistband can be folded up on itself for a less longer fit- as it is it comes to just over the knee on me. Like I said before, it is made from pvc cotton so it can be easily wiped clean and another feature I liked was the patch pocket on the front-handy for the mobile phone whilst busy in the kitchen. The apron is lightweight and has a high neckline with a thick collar which does not cut in, making it comfortable to wear. As you can see, this is my first wear of it so excuse the creases-it just goes to show I need to get cooking more often and not wait for hubby to get in from work to cook the dinner (still having second thoughts on this though!!). 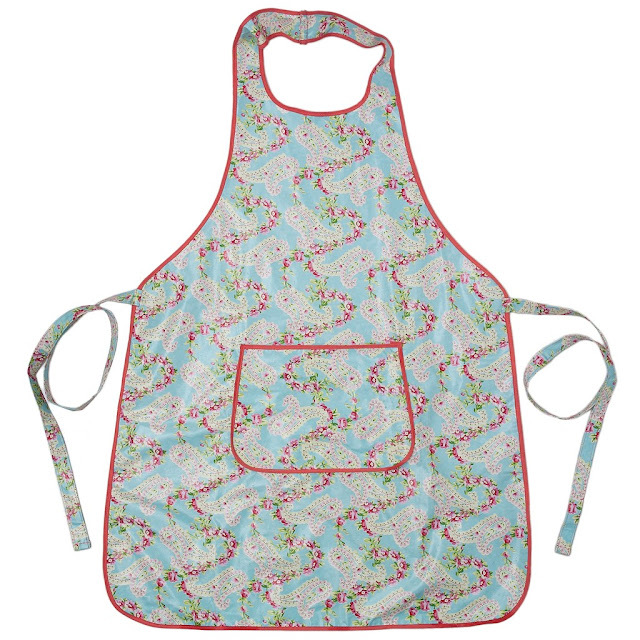 The apron is a great buy for only £8.95 and will make an ideal mothers day gift to yourself or to your own mum or mum in law! If an apron is not on your agenda, then do check out their website which features gifts by occasion and interests and also for the home and garden so it's very likely you'll find the ideal mothers day gift or treat for yourself at a very reasonable price too! 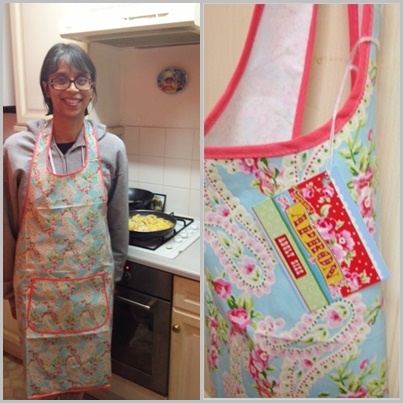 Thanks to Rexlondon.com- I am very happy with the apron and definitely feel it is good quality and value for money and so pretty too! I love it it looks so cute !! Love the mint color and the pink flowers on the apron. Its also good to hear that you are satisfied with it as well. What were you cooking? It looks good! Hi ofelia-it was paella, quite delicious too thanks! !